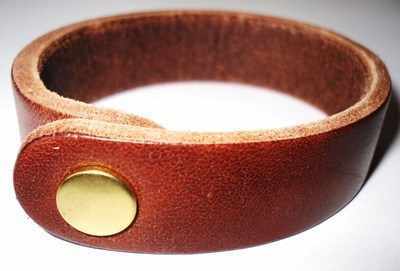 Made from a top quality English tanned leather. The rein holder is 8 1/8" long by 9/16" wide and fits the D rings of English, Western and Australian stock saddles. It fastens firmly with a solid brass press stud. Strong enough to hold your rope securely in place, but will open under pressure if your rope gets caught up on anything. The rein holder has a thickness of approx. 2mm, weighs approx 10 grms and is very supple. The sign of an excellent quality leather that will last you for years. The current stock is a dark brown leather. Pop your rope through the rein holder, form a daisy chain and it is then secure and out of the way when riding.